I was recently talking to a friend who has used ebay for over 10 years but had no idea how to look at completed auction results. This was a big surprise to me since I thought everyone used this feature. Perhaps some of you are unaware of it. Yes, there are millions of active listings out there, but many close without a sale so they are not a good barometer of what your antique bottle is worth. Instead, look at completed auctions that have actually received a bid. This gives you an idea of what people are actually paying. Remember that a single auction does not “make” the value of any item. Some auctions close high, others low. By piecing together the details of a group of auction results for similar old bottles, you can get a sense for your bottle’s market value. Remember also that condition and quality pay a big role in the value of bottles. If the process leaves doubts in your mind, get an appraisal from an experienced collector/dealer. 1. First, you need an ebay account. 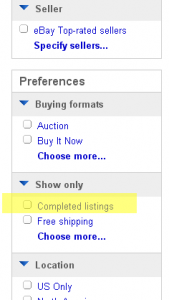 Ebay requires this to browse their completed auction results. There is no way around it, so sign up for an account now. The checkbox will stay selected as you continue to search. I found a 1864 McKenna s nelson county extra Kentucky bourbon whisky w&k bottle . Good condition one small flake on the back side of the bottom . But almost perfect . What do I do with it ? It belongs in a collectors hands. If you are referring to the small white pottery jug with applied handle and blue printing, then those are quite common. You might find a buyer on ebay for $5 or so. Found a blue E.G. Booz’s old cabin whiskey bottle. Is there any value to this bottle? Hard to say exactly without seeing a picture. You can post one at http://forum.antiquebottles-glass.com and someone will answer you there.